As summer approaches, long road trips and exciting weekend getaways are in the works for many families around the nation. Don’t forget, before getting behind the wheels of your car, that car accidents are extremely common and can leave you with physical injuries, emotional trauma, and lost time at work. In addition, you might also have to hire a car accident lawyer to represent you. Keeping your call well maintained goes a long way towards keeping your expenses down. 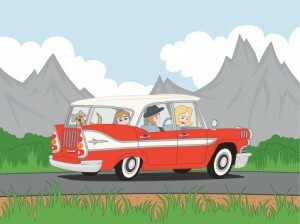 A car that’s been tuned-up regularly is less likely to have serious malfunctions while you are driving on long trips. If you’re headed for a long weekend or a week away in the car, have your mechanic change the oil and check all other aspects of the car quickly. This can save you a great deal of time and money that’s better spent on vacation fun. Tip #2: Have You Checked Your Emergency Kit Lately? Before you head out on a trip, make sure you have a complete emergency kit in the back of the vehicle. Many people assume that having a pair of jumper cables is enough to keep them safe, but that’s incorrect. Keeping extra water, food, and flares on hand can help protect you in the event of a car accident. Sometimes, accidents occur on roads where emergency personnel may not be able to reach you immediately. In the short term, you can alert other drivers to an accident and keep yourself safe and hydrated. If you have already been in an accident, contact your legal representative today. Tip #3: Do You Have Backup Maps? A GPS is a wonderful means of getting yourself to your destination, but it can lose satellite reception or die suddenly, leaving you without a sense of direction. When you’re headed out on a long trip, take extra maps just in case of emergency. Getting lost on unfamiliar roads can put you at greater risk for a car accident and add stress to your vacation. With maps nearby, you can be sure of a timely arrival to your vacation spot regardless of technology failures. Make sure that you have accurate and up-to-date copies of ownership cards and membership verification forms for any roadside assistance programs you belong to. More often than not, these programs will require you to verify your identity before giving you service. Make sure that you have not let the membership expire and review the coverage options you have selected. If you’re headed on a longer trip with a car that you may feel is unreliable, consider upgrading your membership plan for more benefits. Make extra copies to keep in the glove compartment, too. Any long trip can be tempting for trying to make the drive in one or two driving stints. Unless you are shifting with another driver, plan to make reasonable stops to allow you to recover from your fatigue, obtain food, and use the restroom. Do not attempt to drive extremely long stretches all at once, where exhaustion and distractions can significantly impact your driving ability. Plan your stops ahead of time to give you plenty of opportunity to recuperate. Previous post: Big Trucks and Dangerous Lane Changes: Who’s Responsible if They Don’t See You?